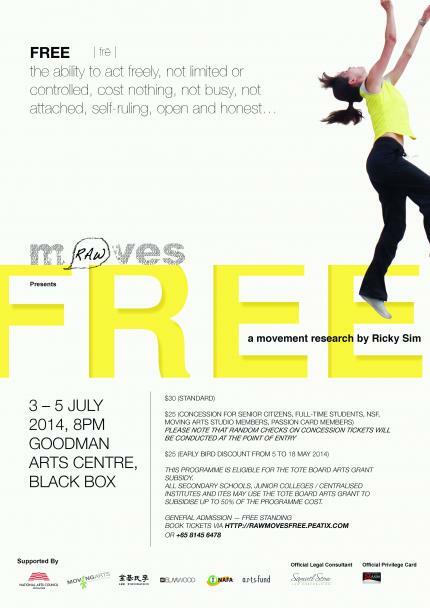 A freefall into the depths of possibility, Ricky Sim's new full-length work for his company, RAW Moves, will be presented at the Goodman Arts Centre Black Box from 3 to 5 July, 2014. Is free will stipulated by external elements and by the state of our own evolution, freedom... within a restricted range? All Secondary Schools, Junior Colleges / Centralised Institutes and ITEs may use the Tote Board Arts Grant to subsidise up to 50% of the programme cost. [BY MRT]: Alight at Circle Line's Mountbatten MRT (Exit B) and turn right towards Mountbatten Rd. [BY BUS]: Alight at Bus Stop (91099) on Mountbatten Rd. Bus numbers 12, 14, 30, 30e, 158, 196, 401.